A Tisbury selectman for 24 years, he hasn’t taken out nomination papers for reelection. Tisbury selectman Tristan Israel says he's made no announcement about his future as a Tisbury selectman. Folks will know for sure on March 6, he said. 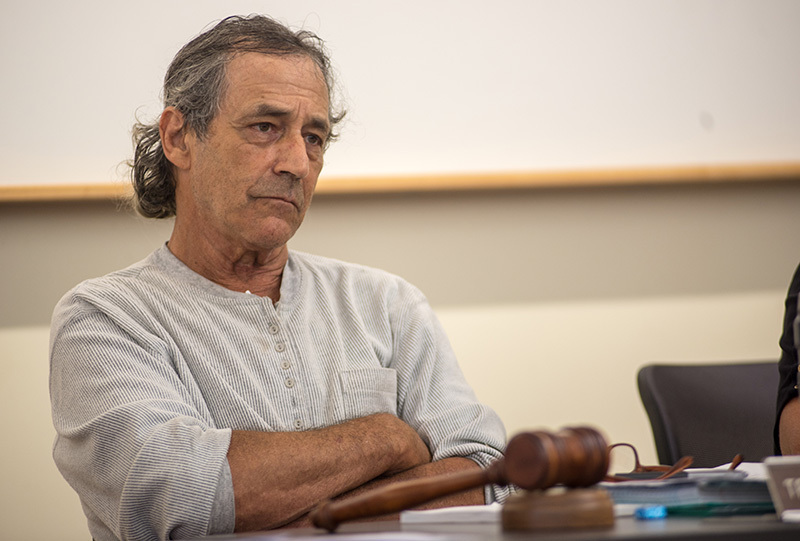 Tristan Israel, an outspoken selectman in Tisbury for the better part of three decades, has been evasive for months about his future on the three-member board. Asked several times in the past few months about his future, Israel has answered the same way each time. “I’m not ready to announce anything,” he told The Times when we first asked in the fall. And, certainly, the tea leaves have pointed for months to Israel not running for re-election. He’s cracked jokes about his age at recent meetings. “I’m 70. I have a few more years left. I’m hoping we’ll have something before I check out,” he said at a meeting Feb. 14, when harbor regulations he’s been actively working on for more than a year were sent for further review. And Israel often refers to how long he’s been around — able to pull out anecdotes about recurring issues and when they’ve been talked about previously. Jeff Kristal, owner of the Crocker House Inn, and Seth Gambino, who owns La Choza, have both returned nominations ahead of the March 5 deadline, town clerk Hillary Conklin said. Kristal, who serves as chairman of the finance committee, and served six years as a selectman, said Israel’s institutional knowledge will be a loss to the board of selectmen. He’s hoping to provide some continuity on the board. “My last few years on the FinCom have rounded out my knowledge,” said Kristal, who left the board voluntarily while his two children were preparing for college. “With one graduating and the other in college, I have more time,” he said. Having served on the zoning board and sewer advisory board, Kristal said, he has knowledge that will be beneficial as changes occur in Vineyard Haven. Israel has served in his role as selectman since 1995, Conklin said after reviewing town records. Israel’s year as chairman has often felt like a retirement tour, but there are still seven days for him to change his mind. “I really just want to fade away as much as I can,” Israel said. Updated with comments from Gambino. – Ed. Gambino claims he is not agaibst change or growth but everyone knows that is a lie. The island absolutely needs an outlet for music and entertainment. It is so severely lacking and now I know why. The music scene is an embarrassment…. Also, how is one music festival, which will almost certainly be mostly established touring bands, be the “outlet” for the Island’s music and entertainment? Kinda putting all your eggs in one theoretical basket aren’t you? I have so many questions. Change is good. Fresh ideas are better. Gambino is not the answer. Knowing him and then his quotes from the article: “Gambino said he’s not anti-change or growth, but”…… Well, “but” means no to me, and that’s narrow minded. Then Gambino says Kristal’s experiences are “a negative in his mind and contributes to a “myopic” view.” Kristal’s experiences are myopic? And negative? Really? A person’s experiences are myopic? Maybe it’s enthusiasm but it comes off as crass and unpolished and unprepared. I don’t think we need that. Not necessarily the island but quite possibly VH. VH seemed to repeatedly shoot themselves in the foot with no plan for recovery. Are you trying to reply to me? You do that by using the reply button, that way, the comment appears under the previous comment and everyone knows that it is a direct reply. If you just write a new comment without directly addressing someone, it gets confusing. If you are replying to me, I never said anything that could give you any idea as to how I feel about the music scene on the Island. I was just pointing out how flawed the “logic” in your statement was. I feel you about Johnny Hoy though. What experience with town government, or politics does Seth Gambino have? His burritos are delicious, when his store is open for more than 2 days a week. We can’t have this kind of unpredictable behavior lounging on the BoS. We need more options in March. Jeff Kristal hands down, without a doubt, this is a no brainer. All of Jeff’s outstanding dedication, proven experience, loyalty, love and genuine concern for Tisbury against a burrito maker with absolutely no experience about anything concerning how our town is run. We now have a outstanding new Police Chief, forming a top shelf professional team of great officers like never before. We definitely do not need our own “AOC”! In closing Thank you very much Tris for your decades of service to our town now please spend your time getting the Dukes County County Commissioners in line and begin starting up another long overdue – County Review Commission – we have been talking about. You definitely got the backing / support from all of us disgusted civilians! Jimmy is doing great, Jeff would be a perfect replacement then we just have to get a third new face to make the board complete! If mr Israel chooses to resign that is clearly up to him. However, it is not up to him as to whether or not he holds that office after his current term ends .